The one bedroom cottage is very spacious and comfortable. 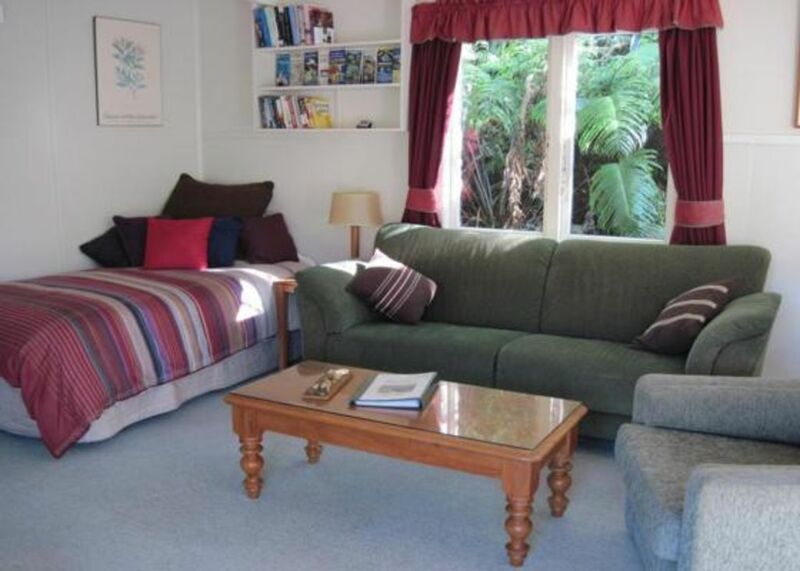 Decorated like a traditional NZ bach (queen bed in the en suite bedroom, single in the living room, comfy sofa and chairs, plenty of reading material, puzzles, board games, big deck over looking the river), it is perfect for a relaxing holiday. Daily servicing, high quality linen and many free services at your door step, however, make it much more than a "bach" holiday. Kayaks, swimming holes, bush walks, guided tours of the glowworm caves, gold panning, rock hunting shoes are all provided free of charge. As are the hammocks, BBQs, wifi, booking service and friendly advise about day trips and your forward journey. The valley is very peaceful and quiet - no road noise - and with only four cottages on the property there is plenty of space for everyone, even in the busy season. Older style in lovely valley and central for visiting the Coramandel Peninsula. A very pleasant stay in an authentic NZ Bach perched on the side of a hill in typical NZ style. A very pleasant stay in an authentic NZ Bach perched on the side of a hill in typical NZ style. The living facilities were clean and tidy with very confortable bedding. The location is perfect for chilling out or as a staging point to discover the Coromandel.